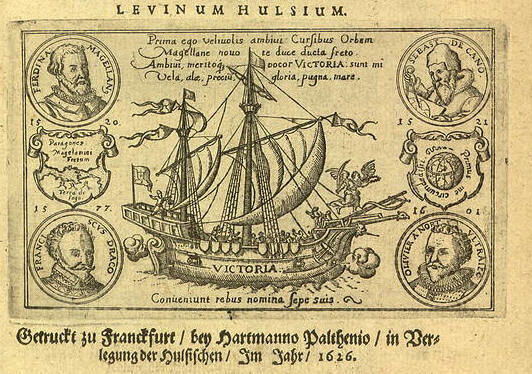 Part of the title page of Levinus Hulsius' collection of voyages, in German, 1626. The first definite account of the Grain Coast derived through the Dutch was compiled by a great German geographerfvdk, Levinus Hulsius, who published from the beginning to the middle of the seventeenth century all the records of navigation to Africa, the East Indies, and America which he could collect chiefly from the captains of Dutch vessels. In the map of Africa which Hulsius printed in 1606 the following place or tribal names occur: Cabo do Monte, “Nesurada”(Mesurado), Rio de S. Biante (Vicente), Cabo de S. Clemente (near Garawé), C. das Palmas, and Ponta de Cavallas (at the mouth of the Cavalla). “Crou” is written along the Kru Coast. Cestos is misspelt Chostes. Sino appears as “Synno,” a spelling very like its present pronunciation. Wappo (at present spelt on the maps Wapi) was a frequent place of call on fvdk Apparently, this information was not correct. Levinus Hulsius, was born in Gent, Flanders (nowadays Belgium) in 1550. He was a historian and geographer. He settled in Germany where he started a printing office in Frankfurt am Main. His heirs continued publishing his works (reprints and new books) after his death in 1606. In 1626 Hulsius published at Frankfurt-am Main an account of the voyages of Samuel Braun to the Guinea Coast (among other parts of West Africa), which were undertaken in 1611 and 1614. Samuel Braun was a Swiss (though in those days he reckoned himself as a German generically), a citizen and dentist (“Burger and Mund Artzt”) of Basel. He first navigated vessels on the Rhine, and thus came into contact with Dutch merchants and seamen. He was offered the command (apparently) of two Dutch ships for an adventure in the Guinea trade. “Die Eynwohner sind grawsame und böse leute doch an einem Ort besser als am andern gedrucken stetigs wie sie die fremde Nationen so dahin kommen zu handthieren,”etc. In 1611 Braun called at the Grain Coast chiefly to buy rice. In 1614 he traded for pepper with iron bars and for rice with coral beads (German: ‘gläserne corallen”); from his first Guinea voyage he brought back to Holland about to two tons of ivory and a thousand pounds of gold. All these journeys bristled with perils from Spanish pirates, with whom sea-fights were of constant occurrence, so that one is quite relieved at the end to know that this honest mariner landed his cargoes safely in Holland and lived to make interesting voyages to the Mediterranean and the Black Sea, then a Turkish Lake.